B Haley grew up on the inner city streets of St. Louis, MO, 3 miles from Ferguson, MO, where the notorious riots took place. He walked down destructive paths filled with violence in an ‘every man for himself’ environment. B was saved by the grace of God during that time, and his life has never been the same. 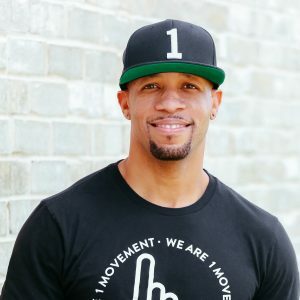 God led B to Nashville where he has been part of one of the most renowned Christian bands of all time- TobyMac and the DiverseCity band- as TobyMac’s drummer. During that time, God gave B a vision that he hasn’t been able to shake. A vision for our world to live united and come together. To put down the many differences that divide us and pick up the one thing that unites us- LOVE. Armed with a blazing passion to make this world a better place through unity, the We Are 1 Movement was birthed. B is a father of 4 beautiful daughters; two are in college, one lives in Florida, and B lives in Nashville with his wife and youngest daughter. B is excited to share this message of hope and love with the next generation. He is available for youth and men’s events, chapels, camps, and church wide events.